We experience our first introduction to a traditional European breakfast at our hotel the next morning---which includes meat and cheese--cold cuts in America. There is also a generous offering of yogurt, fruit, cereal and breads--but the mainstay in breakfast here seems to be the cold cuts. 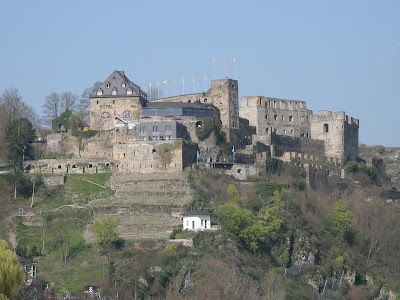 We are off to hike up the hill to the ruins of the Rheinfels castle. 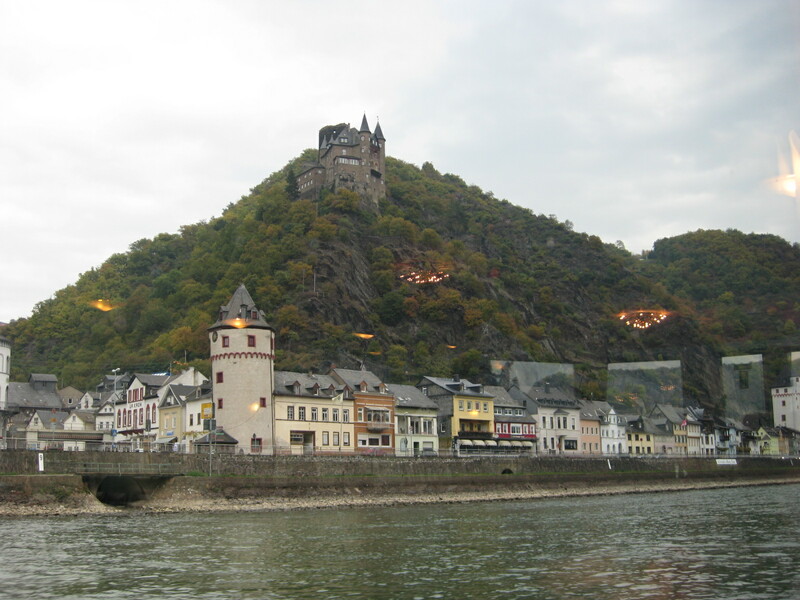 Once the largest and most imposing castle on the Rhine River it was built in 1245. Falling to ruin and becoming a stone quarry, the castle is finally recognized for its historical significance and rescued from total demise. Walking through the ghost of this once mighty fortress, you can hear the century's old echo of a thriving civilization on the winds which breeze around the corners. It is remarkable to realize these stones were put into place hundreds of years ago and have survived the ravages of man and time. Back to the village, we enjoy a delicious sandwich made in the local bakery and of course a cup of the wonderful hot chocolate. There might have been a treat or two secreted in our back packs when leaving this aromatic delight. Time for our float trip down the beautiful Rhine River on a paddle boat. 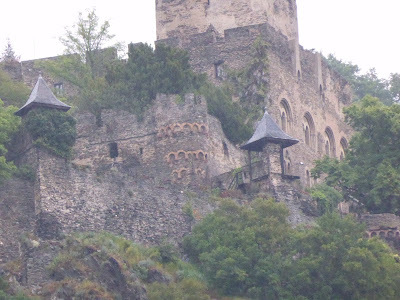 I see why one of my mother's favorite trips was a cruise down the Rhine---scenic villages, ancient ruins, vineyards on the hillsides, and the Black Forest all create a optical feast--even in the never ending rain. We disembark in Bacharach---and once again walk across cobblestone streets winding through the quaint village to the one bench train station. Two of us sit and guard the luggage while the others go off to explore. Finally catching our connection, we are our way to Freiburg and once again at the mercy of the Eurorail train system. Our second connection of the day is 10 minutes late and is beginning to put a kink in the plans. Then we sit on a side spur for quite a while waiting to get across a two lane bridge-quite like merging onto the freeway in any metropolis during rush hour. We miss our connection-SIGH- but thankfully there is another train headed the same way an hour later. We are met at the station by the Brandt's high school exchange student and his family. So thankful for those who lead the lost in a strange land! They lead us back to our hotel---dragging the luggage and carrying the bags--over the cobblestone streets for what seems like a mile. 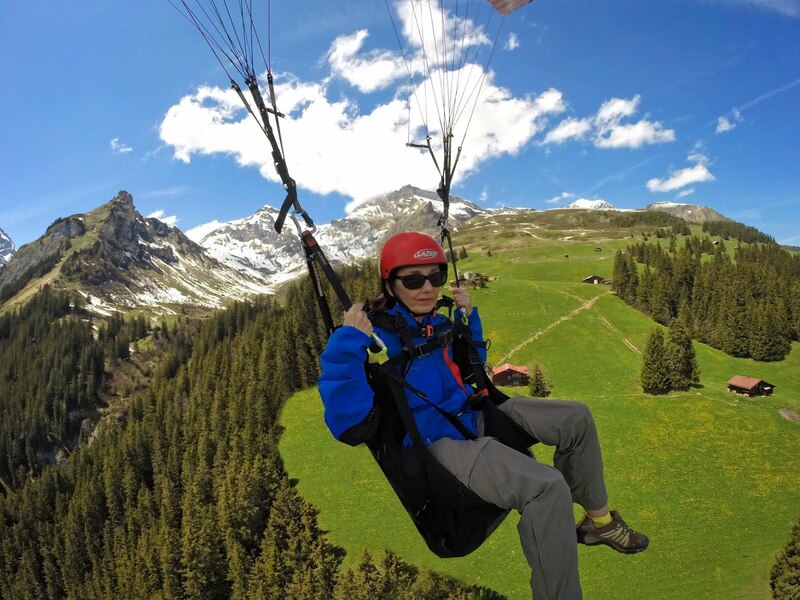 Hopefully German wheel technology will hold up on the new bag! 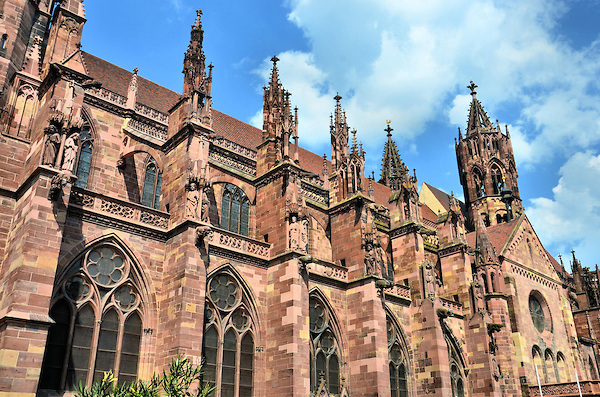 we open the windows to this view---Freiburg Cathedral. A LONG day is ended with a typical German feast--courtesy of our German hosts. THEY LOVE meat---and potatoes here! I am a FIRM believer that there are NO accidents in life! What city is you sil in? The castle & cathedral are absolutely amazing!! Can't imagine what it was like to stand in the presence of each!! Fully enjoying your trip , and I'm sure it's a pleasure for you to relive theses places. Thanks! I kept a journal while traveling which I faithfully recorded in daily. I am not though the group photographer- so matching 750 photos to the day's events has been a challenge at times! It has been fun to remember the day & relive the adventure via the written word. 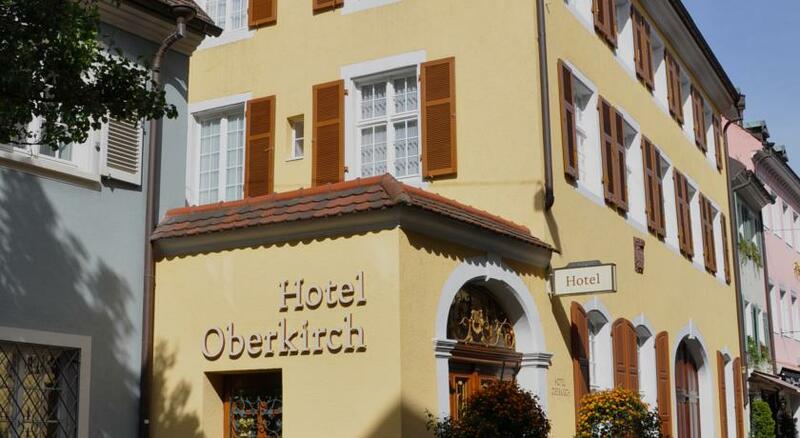 What you describe is what we call over here a Continental Breakfast. An English Breakfast is quite different. Start with fruit juice and cereals, then a plate of bacon, sausage, black pudding, egg, beans and hask browns. Followed by toast with marmalade or jam. Coffee or tea. I really love your photos. Thank you for keeping a diary of your trip for our enjoyment. I am NOT sure where you put all that food, Victor! I am a one granola bar lady along with one diet cola. Thank you for the explanation. Perhaps SOME DAY I will get to England and give that English Breakfast a try--all except for the black pudding---GROSS!